What is Deferred Tax Asset and how do we calculate it? How to calculate changes in trade receivables/payables for the cash flow statement? Resources to understand Deferred Tax Assets & Deferred Tax Liabilities? What is Deferred Tax Assets and how do we calculate it? I attended your “Peaceful Investing” Workshop in Bangalore in July 2017 and was impressed by your clarity of thought and attention to detail. Thanks for teaching investors like me, the tricks of this trade. 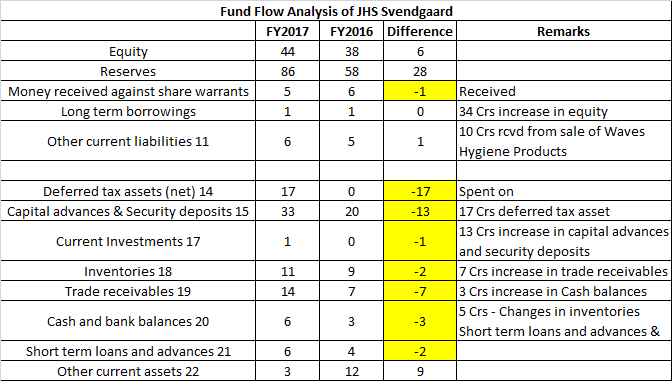 I was doing the fund flow analysis for JHS Svendgaard and had a doubt with the deferred tax asset part of this company’s balance sheet. I have attached my fund flow analysis for this company, but I am not entirely clear as to why deferred tax assets are being added instead of being subtracted. If you shed some light on this aspect, it would be helpful. Thanks for writing to us! It was great to have you at the workshop! You would notice that the deferred tax assets have increased by ₹17 cr. In case of fund flow analysis, we treat all asset increases as outflow. 1) Due to losses: E.g. in case of JHS, you would read at page 99 that the company sold a few fixed assets not in active use and Waves Hygiene Products in FY2016. It had sold them at a loss (about Rs. 17 cr.) and it would adjust this loss against profits of future years. 2) Due to different treatment of expenses by companies act and income tax act: E.g. when income tax act does not allow something to be deducted as an expense which is otherwise allowed by companies act as an expense. In these cases, the company will pay higher tax as per income tax act than as per companies act. 2) Regarding the addition of an almost full amount of loss as DTA in the tax section in the P&L, it is again difficult to understand on the similar lines of argument in the point 1 above. It seems that this entry in the tax section of P&L, which increases PAT, is needed to show higher reserves/equity on the liability side of the balance sheet. Showing higher equity/liabilities is essential because on the asset side the company seems to have shown higher assets (entire loss e.g. Rs. 100 instead of only the amount of benefit/adjustment in future tax e.g. Rs. 30). We believe that a CA can be a better person to comment whether JHS is right in handling the treatment of business losses in the manner that it did or it is an attempt to inflate profits. It might be that there is more information required from the company about any other key items, which have affected the treatment of business losses to make it treat the entire loss as DTA instead of only the amount of future tax benefits. I have a doubt on Fund Flow Analysis. While analyzing the balance sheet with respect to cash flow statement, the amount seems to be a bit different. Could you please assist me? The change in the trade receivables, as well as trade payables in the balance sheet, is many times different from the changes mentioned in the cash flow statement. In the cash flow statement, many times, companies club the trade receivables and trade payables with certain other items under current assets and current liabilities respectively. Therefore, many times, investors would notice that the figures of changes in only “Trade receivables” and “Trade Payables” are not matching with the figures in cash flow statement. Moreover, you would notice that in the cash flow statement, the companies have started labeling these items as “Trade and other receivables” and “Trade and other payables”. In the “Trade and other receivables”, most of the times, the items under “Short-term loans & advances” (STLA) are clubbed. You may go through the details of the items under “Short-term loans & advances” (excluding the changes in the tax-related items under STLA) and try to club their changes with trade receivables and in most of the cases, you would be able to approximate/tally it with the figures in the cash flow statement. Similarly, in case of “Trade and other payables”, many times, companies club other items under current liabilities, especially from section “Other current liabilities” and provisions along with trade payables. Therefore, there are differences in the changes in the “Trade payables” in the balance sheet and the cash flow statement. You may study the items under “Other current liabilities” and “provisions” and see their changes. They will provide you the explanation for the differences observed by you. Hope it will resolve your queries. I request your inputs on deferred tax implications. Can you please guide me to understand the implications if a company posted quarterly results with an increase in deferred tax when comparing Q-o-Q results? This question came to me while going through recently declared results by Pennar Industries. There is a significant change in deferred taxes and current tax liability from Sep’ 2017 to Dec’ 2017. In addition, if a company deferred taxes to a later period, where does it show in their balance sheet? I appreciate your time and valuable inputs. The above articles would give you a lot of understanding about deferred tax. The deferred tax assets, as well as liability, are shown on the balance sheet. DTA under non-current assets and DTL under non-current liabilities. Many times, when companies have both DTA and DTL due to different factors, then they may adjust one with other and then the net DTA or net DTL on assets side or the liabilities side, as the case may be.